51-page Medicinal Products Lifecycle document. Enterprise-wide Use License. 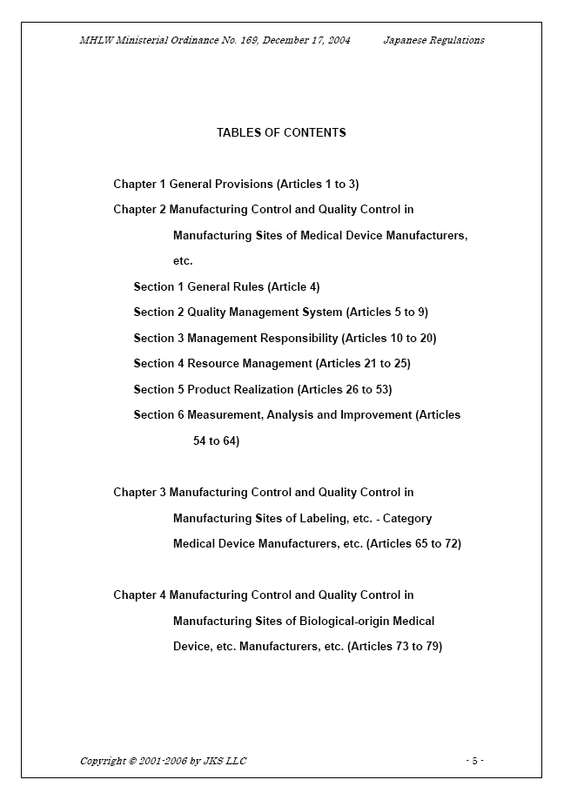 Full text in English of the MHLW Ministerial Ordinance on Standards for Manufacturing Control and Quality Control for Medical Devices and In-vitro Diagnostic Reagents, MHLW Ordinance No. 169, December 17, 2004 (also known as the “Quality Management Systems Ordinance" or shortly as the “QMS Ordinance". Formatted, indexed, annotated and hyperlinked. Jouhou Koukai Publishing is a Jouhou Koukai business: pharmaceuticals, medical devices, drug approval, regulations, clinical trials, Japan pharmaceutical affairs, and global and Japanese regulatory affairs. Retrieval and consulting on drug approval and technical documents disclosed in Japan. (ISSN 1550-3437) Copyright © JKS LLC 2006.